Welcome to my website! Oink! The purpose of this web site is to annoy dogs and educate people about wild boars. Along the way, I might even persuade someone to buy an Arnold Mundus t-shirt. If you're looking for Arnold the action movie star, Arnold the body builder and Arnold the personal fitness trainer, well, you've come to the wrong site, but don't let that stop you visiting my home page. Coming soon: Arnold the artist! I'll let you know when to check Ebay for my painting auction. I'm a regular pigcasso! Check out the front cover of my new magazine "Arnold Revealed!" If you have any questions for me, you can Ask Arnold and I will try to answer them. DAILY COMMENT: Did you notice the boar and hog hunting supply ads at the top of my page? Hmm, I wonder where they got the idea that I am a hunting guide, and why would I wear a vest and scent, and speak Russian . . . ? 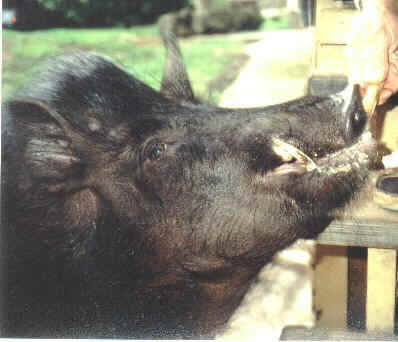 ***WARNING: Wild Boars do not make good pets. Most of them are very aggressive and destructive in adulthood. They are very powerful and hate dogs. My owners did not bring me home from the woods. I was an orphan who found my way to their house. All photos on this website are Copyrighted ©2000-2008 J. M. Mundus. All Rights Reserved.